Since 1988 dozens of our wildlife and beauty segments have closed the weekly show hosted by Charles Kuralt and Charles Osgood. It's been fun traveling the country but we also have many options in our own backyard, including Bosque del Apache National Wildlife Refuge in southern New Mexico. 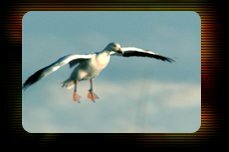 Sunday Morning has broadcast our images from Bosque del Apache for over ten years. Often the "hero shot" is the fly-in of hundreds, sometimes thousands of geese and Sandhill Cranes. Other times a dramatic orange and purple sunrise steals the show. We've also featured hawks, coyotes, Whooping Cranes - and once - an amusing segment we called "ducks on thin ice".